Alexander Luria – life, research and contribution to neuroscience. from The Neuropsychotherapist on Vimeo. This article focuses on the Soviet psychologist and founder of Russian neuropsychology, Alexander Romanovich Luria, and his contribution to the development of neuroscience globally. The article begins with a short biography, with particular focus on the formation of Luria’s theoretical views. Key aspects of theory concerning the structural and functional organization of the brain are then discussed, including Luria’s ideas on the three principal functional units and the interaction between them. In conclusion, Luria’s scientific ideas are compared to developments in contemporary research. It has been regretfully noted that a dearth of documentary materials exists on both the origins of Soviet neuropsychology and the life of its founder, Alexander Romanovich Luria (Akhutina, 2003, p. 160; Luria, 1979, p. 190). Among the possible reasons for this are the restricted nature of the political and scientific environments of the time, a deficit in translation, the complexity of theoretical principles involved, and perhaps the modesty or reserved character of the author himself (Luria, 1979, p. 189). Despite the above-mentioned as well as other complications, works of Luria did receive recognition, mostly in the United States and Europe (Ardila, 1991; Goldberg, 1990; Golden & Berg, 1981; Holowinsky, 1993; Lewis, Hutchens, & Garland, 1993; Solso & Hoffman, 1991; Tulviste & Hall, 1991; Tupper, 1999). However, it seems that recognition could have extended far beyond these areas. Acknowledging the deep interest and fascination for the figure of Luria shared by many of his contemporaries and disciples, we aim to present here a brief overview of his scientific achievements. At first glance one might find the course of Luria’s scientific career somewhat incoherent or, as put by Michael Cole, “otherwise disjointed” (Luria, 1979, p. 198). However, this will be viewed against the backdrop of social discord at the time, in which few central motifs and a variety of “secondary themes” become apparent. The immediate family of Luria resided in Kazan, an old university town and major commercial center on the Volga River, 600 miles southeast of Moscow. Being born in 1902 and brought up in an atmosphere “sympathetic to the revolutionary movement” (Luria, 1979, p. 18), Luria and his relatives had to face all the difficulties that a Jewish family might encounter at that time of hardship. Thus, only after the freedom of the October 1917 Revolution was Luria’s father Roman Albertovich, a qualified medical school doctor, offered a position at the University of Kazan. He would later become vice-director of the Central Institute for Advanced Medical Studies in Moscow. Refusing to embark on a purely medical career, Alexander Romanovich nevertheless always maintained a connection with medical schools, and shared with his father a particular interest in German psychosomatic science. The climate of intellectual development that dominated his family as well as a profound knowledge of German, French and English enabled Luria to reconcile major scientific ideas of his predecessors and contemporaries. By his own account, Luria was influenced by such outstanding scholars as Harald Høffding, Sigmund Freud, Alfred Adler, Carl Jung, and Lev Tolstoy, as well as by works of the German neo-Kantians, including Heinrich Rickert, Wilhelm Windelband, and Wilhelm Diltey (Luria, 1976, 1979; Vygotsky & Luria, 1925/1994). It is worth noting that in his autobiographic work, Luria admits that his “primary ambition was to become a psychologist” and “to take part in the creation of an objective approach to behavior that concentrated on real-life events” (Luria, 1979, p. 25). Following gymnasium study from 1912 to 1918, Luria was accepted into the Faculty of Social Sciences at Kazan University. At that time he also became active in the Student Scientific Societies, where for the first time he devoted himself to works of Wundt, Titchener, and Ebbinghaus (Kuzovleva & Das, 1999, p. 53). In 1921 Luria continued his education in the Medical Department of Kazan University. Being especially interested in psychoanalysis, Luria organized the Kazan Psychoanalysis Study Group, with the first meeting held in 1922. After completing his report on “The Modern Condition of Psychoanalysis,” Luria sent a letter to Sigmund Freud, notifying him of the existence of the group in Russia. In his answer, Freud expressed much surprise and gave authorization to translate his work (Glozman, 2007, p. 172). After publishing in 1923 a monograph on the basic tendencies of modern psychology, Luria began to write articles for the journal Problems of Psychophysiology of Labor and Reflexology. It was this that attracted the attention of Professor K. N. Kornilov, the Director of the Moscow Institute of Psychology, who subsequently invited the young Luria to conduct research in Moscow. In Moscow, Luria started lecturing at the Academy of Communist Education. Later, he simultaneously became head of the psychological laboratory in Kornilov’s Institute, the laboratory in the Institute of Criminalistics, and the psychological laboratory in the Academy of Communist Education. Due to a lifelong reticence to discuss aspects of his personal life, it has only recently become evident that between 1923 and 1930 Luria also married his first wife, Vera Blagovidova (Kuzovleva & Das, 1999, p. 54). During the late 1920s, Luria worked at the Institute of Psychology with another remarkable Russian psychologist, Alexei Nikolaevich Leontiev, on the combined motor method for the purpose of understanding complex human behavior or the influence of affective reactions on motor reactions. As the result of their work, several articles were published, leading to further development of the first lie detector in the criminal justice setting (Luria, 1979, p. 196). In 1922 Luria published his first large work, entitled Principles of Real Psychology, in which he formulated the methodological basis of Soviet/Russian neuropsychology that was later adopted by his disciples (Glozman, 2007, p. 172). It was January 1924—the “turning point” in his life (Luria, 1979, p. 37)—when during the Second Psychoneurological Congress in Leningrad (present-day St. Petersburg), Luria first met Lev Semyonovich Vygotsky. Vygotsky soon joined Luria and Leontiev in Moscow, and the newly formed “troika” began its work on a thorough revision of major developments over the preceding years in psychology, sociology, and biological theory. These young scholars “had the temerity” (Luria, 1979, p. 205) to question many theories and aimed to create the new Soviet psychology. At that time, Luria and Vygotsky also started their first experiments on patients with brain impairment. Initially they tried to determine the relationship between the elementary and higher forms of mental activity as well as their cerebral representation in healthy adults. Further on, the young researchers focused on the processes that might appear in the conditions of brain impairment in early abnormal ontogenetic development (Glozman, 2007, p. 172). In the end, they came up with some first ideas on the social-historical approach to the origins of human mind. Concurrently, a group of five students including L. I. Bozhovich, R. E. Levina, N. G. Morozova, L. S. Slavina, and A. Zaporozhets joined “troika” and began a new scientific school with the focus on symbolic activities in their research. In addition to the work with Vygotsky, this period was significant for Luria in establishing his ideas on the planning and regulating role of speech and aphasia as the first developments of Russian neuropsychology. In 1929 Luria presented two of his works at the Psychological Congress in the United States: the first on the combined motor method, and the second on egocentric speech in children. It was on a trip to Germany during this time that he also met Levin, Kohler, and Zeigarnik, and participated in the experiments of Dembo. In 1931 Luria carried out his first expedition to the Central Asian region of the Soviet Union, the Republic of Uzbekistan, with a second expedition following in 1932. As a result of hostile interrogation by the government, however, Luria was first accused of research based on racism theories, and by 1932 the Vygotsky group had to cease their investigation of the social-historical development of mental processes. In 1932 Liveright published Luria’s notorious work The Nature of Human Conflicts (reissued in 1976) on the basis of his doctoral dissertation. In 1933 Luria married Lana Linchina, a scientist, who remained his wife for the rest of his life. Luria and Lana had a daughter, Elena Alexandrovna Luria, who went on to become a distinguished microbiologist (Kuzovleva & Das, 1999, p. 54). Due to censorship persecution, Luria had to leave Moscow for Kharkov along with some of his colleagues, where he started lecturing at the Academy of Psychoneurology as well as studying at the Medical Institute and working at the clinic. At that time, Luria continued his investigation of the changes of mental processes in patients with brain impairments. In 1934 he returned to Moscow and became head of the Laboratory of Psychology in the Moscow Medical Genetics Institute and the Laboratory of Pathopsychology in the All-Union Institute of Experimental Medicine. This period of scientific work is remarkable for the study of the development of identical and fraternal twins and the role of heredity and external factors in mental processes. However, due to yet another governmental restriction on genetic psychology in 1936, Luria was forced to leave all his places of work and became a full-time student of the First Medical Institute, while he worked on his doctoral dissertation. 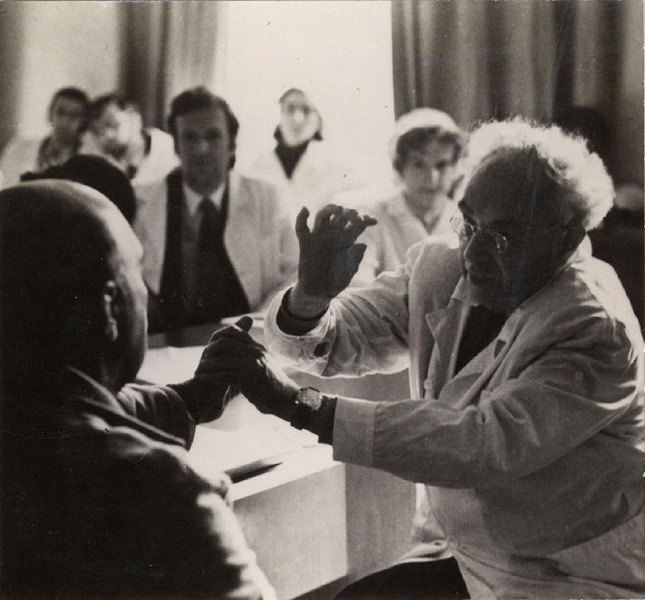 In 1937 Luria presented his dissertation on sensory aphasia at the Tbilisi Institute of Psychology and graduated with a medical degree from the First Moscow Medical Institute. Later he worked as a neurologist at Burdenko’s Neurosurgical Institute in Moscow, developing methods of diagnosis of cerebral lesions. During the period from 1937 to 1941, Luria worked at the neurological clinic of the Institute of Experimental Medicine as head of the Laboratory of Experimental Psychology, with a focus on the study of three forms of aphasia. At the beginning of World War II, he organized a base neurosurgical hospital in the village of Kisegach in the South Urals. This time enabled Luria to assemble an enormous collection of data, facilitating work in two main directions: firstly, devising methods for the diagnosis of local cerebral lesions and the side effects caused by the brain damage involved, and secondly, developing rational scientific methods for the rehabilitation and treatment of patients. Back in Moscow in 1945, Luria began working at the clinic of the Neurosurgical Institute and lecturing at Moscow University. He was among a group of colleagues who laid the foundation for the Faculty of Psychology at the Lomonosov Moscow State University, where from 1968 he headed the Department of Patho- and Neuropsychology (Zhdan & Homskaya, 1997). Luria’s famous book The Man with a Shattered World: The History of a Brain Wound (1972/1987a) would come to exemplify the next neurological stage of his scientific career. Soon, however, in 1950, the harshness of the political environment in the Soviet Union prompted Luria along a different pathway once again. The “ideological defeat of Soviet biological and medical sciences” (Kuzovleva & Das, 1999, p. 55) initiated by Stalin led Luria to start work at the Institute of Defectology. There he expressed interest in research into the planning and regulatory role of speech in human behavior, and particularly in the development of verbal regulation in mentally retarded children. While concurrently lecturing at Moscow University, Luria managed to develop specific tests for children for diagnostic and treatment purposes. The main focus of these psychological tools remained on speech development in special education settings. In the years following the death of Stalin in 1953, there was an easing of restrictions behind the Iron Curtain, and from 1955 it became possible to exchange knowledge and experience between the Soviet Union and other countries. Many American psychologists as well as the Swiss developmental psychologist Jean Piaget made visits to Luria’s laboratory, while Luria himself travelled to Norway, Brussels, and London, lecturing and participating in scientific discussions. In 1959 Luria was elected to re-establish the Neurosurgical Institute, where, with the help of his former students Fillipicheva, Homskaya, Pradina, and Tsvetkova, the laboratory continued the study of the organization of mental functions in the brain. The work was dedicated to the methods and procedures of localization and the restoration of cerebral impairments and corresponding functions. In the following decade, Luria spent some time abroad, attending a symposium at Princeton University, lecturing in North America, meeting Jerome Bruner in Montreal and, later, Skinner and Pribam at the XVIIIth International Psychological Congress in Moscow. Over time he gained international recognition, becoming a member of the National Academy of Sciences (in the USA), American Academy of Arts and Sciences, American Academy of Pedagogics, and several psychological societies in France, Great Britain, Switzerland and Spain (Kuzovleva & Das, 1999, p. 56). From the time of the re-establishment of the laboratory in the Neurosurgical Institute until the end of life, Luria primarily concentrated on the cerebral organization of human mental processes. He introduced the concept of the three principal functional units of the brain, described the organ’s systemic structure and functioning, and laid down some of the core principles of neuropsychology. In the late 1960s, Luria shifted his interest to the dysfunction of the frontal lobes, leading to the second volume of Human Brain and Psychological Processes (1966). Later, Luria set out to write Cognitive Development: Its Cultural and Social Foundations (1976b), where he could finally discuss openly his research conducted in Central Asia. The late 1960s and 1970s were fruitful in terms of publications in Russia and abroad. The list of Luria’s more remarkable works includes Restoration After Brain Injury (1963), Higher Cortical Functions in Man (1966), Traumatic Aphasia: Its Syndromes, Psychology, and Treatment (1970), The Working Brain: An Introduction to Neuropsychology (1973), Basic Problems of Neurolinguistics (1976a), The Neuropsychology of Memory (1976d), and The Mind of Mnemonist: A Little Book About a Vast Memory (1968/1987b). In 1979, with the assistance of American psychologist Michael Cole and his wife Sheila Cole, Luria published his autobiography The Making of Mind: A Personal Account of Soviet Psychology. The last years of Luria’s life are characterized by his ideas on a new approach to the structure of memory, new branches of neuropsychology such as neurolinguistics, and the study of the interrelationship between brain hemispheres (Kuzovleva & Das, 1999, p. 56). Just weeks after his 75th birthday, on August 14, 1977, Alexander Romanovich Luria died from a heart attack in Moscow. At the time, he was writing what would be his last work, entitled Paradoxes of Memory, the English volume of which was published only in 1982 (Homskaya, 2011, p. 117). Luria posited that human mental processes represented complex functional systems that involved groups of brain areas working in concert, each making a unique contribution to the organization of a functional system. the unit for programming, regulation and verifying mental activity. Each of these three units appears to have a hierarchical structure comprising three cortical zones based one upon the other: the primary (projection) area, which receives impulses from or sends impulses to the periphery, the secondary (projection-association) area, where incoming information is processed and programs are prepared, and the tertiary (zones of overlapping) areas—the latest systems of the cerebral hemispheres to develop, which are responsible for the most complex forms of mental activity requiring the concerted involvement of many cortical areas. Luria argued that the organized course of mental activity—when one is receiving and analyzing information, the activity is programmed, and the mental processes are checked by mistake correction—cannot be obtained without the waking state. M. N. Livanov invented the “toposcope,” which enabled researchers to visualize between 60 and 150 points of cortical excitation, as well as their dynamics, in the cortex of a waking animal. Luria mentioned in this regard Magoun and Moruzzi, who in 1949 showed that the reticular formation in the brain stem, with the structure of a nerve net, gradually modulates the whole state of the nervous system (Luria, 1973, p. 46). This finding showed that the structures maintaining and regulating cortical tone are located in the subcortex and brain stem, and have a double relationship with the cortex. Specifically, the ascending reticular system activates the cortex and regulates the state of activity, while the descending reticular system subordinates the lower structures to the control of the cortex. Luria claimed that this discovery was suggestive of a vertical organization to all structures of the brain, with the first functional unit of the brain maintaining cortical tone and the waking state and regulating these states in accordance with the conditions confronting the organism. Importantly, the reticular formation had both activating and inhibiting portions (Luria, 1973, p. 52). According to Luria, the reticular system had certain qualities of differentiation or “specificity” in regards both to its anatomical structure and its sources and manifestations. The first of three principle sources of activation of the reticular formation was the metabolic processes leading to the maintenance of homeostasis. The reticular formation of the medulla (bulbar) and mesencephalon (mesencephalo-hypothalamic), closely related to the hypothalamus, played a significant part in this “vital” form of activation (Luria, 1973, p. 53). The higher nuclei of the mesencephalic, diencephalic, and limbic reticular formation also took part in more complex systems of instinctive or unconditioned-reflex food-getting, sexual and defensive behavior. These two subdivisions of activation sources were similar in that they occurred in the body, but different in their level of complexity. The second source of activation related to the arrival of stimuli from the outside world and represented an orienting reflex (Luria, 1973, p. 54). Here Luria referred to the experiments of Hebb (1955) and the human need for incoming information. He further elaborated on the investigative activity of humans as well as the need for increased alertness as the form of mobilization in a constantly changing environment. It is important to emphasize that the tonic and generalized forms of the activation, Luria allocated to the lower regions of the reticular formation, while the phasic and local forms (“more complex, vital or conditioned-reflex in character”) were allocated to the higher structures such as the non-specific thalamic region and limbic system (Luria, 1973, p. 57). The third source of activation was represented by “intentions and plans, by forecasts and programmes” (Luria, 1973, p. 57) that were social in their motivation and formed consciously and with the help of speech. It is noteworthy that Luria viewed these highest forms of organizational activity as subject to the vertical principle of construction in the functional systems of the brain. Observing the medial zones of the cortical zones in this unit, Luria claimed that they played a role in the “regulation of the general state, modification of the tone and control over the inclinations and emotions” (Luria, 1973, p. 60). In summarizing his findings concerning this first functional unit, Luria asserted that impairments showed the relation between disturbances of memory and disturbances of consciousness (Luria, 1973, p. 67). The brain regions of Luria’s second principal functional unit are in the neocortex on the convex surface of the hemispheres—the posterior regions including the visual (occipital), auditory (temporal) and general sensory (parietal) regions. Importantly, this unit consists of isolated neurons, working in accordance with the “all or nothing” rule (Luria, 1973, p. 67). In general the unit represents the “cerebral mechanisms of modally specific forms of gnostic processes” (Luria, 1973, p. 72). This unit is characterized by high modal specificity of the primary and projection areas. Those modally-specific zones are built in accordance with a single principle of hierarchical organization articulated by Campbell (as cited in Luria, 1973, p. 71), where each of the cortical structures is seen as the central cortical apparatus of a modally-specific analyzer. The primary zones of the cortical regions of this unit also have “multimodal” cells that can respond to several types of stimuli, and cells that do not respond to any modally specific type of stimuli. The core projection areas of this unit are surrounded by systems of secondary (or gnostic) cortical zones that contain more associative neurons to implement the synthetic function of converting the somatotopic projection of impulses into their functional organization. The tertiary zones of this brain system—the “zones of overlapping”—are responsible for the combined work of several groups of analyzers and hypothetically respond to general features of stimuli. They mostly occupy the inferior parietal region that after Flechsig was seen as the “posterior associative center” typical particularly of humans (Luria, 1973, p. 73). These zones enable the “transition from direct, visually represented syntheses to the level of symbolic processes” and also play a role in the “memorizing of organized experience” (Luria, 1973, p. 74). Luria defined three fundamental laws of the work structure of the cortical zones of the second and the third brain units (Luria, 1973, p. 74). Law of the hierarchical structure of the cortical zones: The primary, secondary and tertiary cortical zones are engaged in the complex synthesis of information and change in the course of ontogenetic development. According to Vygotsky (as cited in Luria, 1973), the interaction between the cortical zones goes “from below upward,” meaning that defects of the lower zones in infancy must lead to incomplete development of the higher zones. By contrast, among adults the interaction goes “from above downward,” and the tertiary zones then have a compensatory influence if the secondary zones are damaged (p. 74). Luria emphasized that the secondary and the tertiary cortical zones show more “functional properties” than the primary ones and play an “organizing, integrative role in the work of the more specific areas” which is necessary for more complex gnostic processes (Luria, 1973, p. 77). With the occurrence of right-handedness in humans, due to processes such as work and speech, some degree of lateralization of functions takes place (Luria, 1973). Thus, the left and dominant hemisphere in right-handers begins to lead in the “cerebral organization of all higher forms of cognitive activity connected with speech” (p. 78). However, this dominance of the left hemisphere is relative in character (Luria, 1973). The third principal functional unit is responsible for human intentions, the formation of plans and programs of actions, inspection of performance, verification of conscious activity, and regulation of behavior (Luria, 1973). The motor cortex and the parts of the great pyramidal tract are core brain structures of the unit (this cortical area is projectional in character). However, a tonic background is also requited, delivered by the basal motor ganglia and the fibers of the extrapyramidal system. The primary projective motor cortex is seen as the “outlet channel” (Luria, 1973, p. 80) for motor impulses. The impulses should be well prepared with the help of superposed secondary areas of the motor cortex, and only after that can they be sent out to the precentorial gyrus and then to the giant pyramidal cells. Other structures responsible for preparation of motor programs include the upper layers of the cortex and the extracellular grey matter of dendrites and glia that controls the giant pyramidal cells of Betz. This unit, therefore, as an efferent system, runs in the descending direction, starting from the highest levels of the tertiary and secondary zones where the motor plans are formed, to the structures of the primary motor area and periphery (Luria, 1973). Importantly, the premotor areas can be allocated to the secondary divisions of the cortex. These areas play an organizing role for movements. The second distinctive feature of this unit is that it works under the influence of the second or afferent brain unit and consists entirely of systems of efferent zones. Finally, the prefrontal cortex region of this unit “plays an essential role in regulating the state of activity” in accordance with complex intentions and plans formulated with the help of speech (Luria, 1973, p. 86). Luria also claims that the prefrontal regions have “two-way connections,” both with the lower structures of the brain stem and diencephalon, and with all other parts of the cerebral cortex (Luria, 1973, p. 88). Thus, Luria concluded that the “tertiary portions of the frontal lobes are in fact a superstructure above all other parts of the cerebral cortex” and that they “perform a far more universal function of general regulation of behavior” than other tertiary regions (Luria, 1973, p. 89). Luria further elaborated that the frontal lobes are “responsible for the orientation of an animal’s behaviour not only to the present, but also to the future,” and therefore to the most complex forms of active behavior (Luria, 1973, p. 91). The final important feature of the frontal lobes is seen in the feedback mechanism or “reverse afferentation” as the necessary component of any organized action (Luria, 1973, p. 91), which has been described by the famous Russian physiologist Pyotr Anokhin (1935) in his theory of functional systems as the “action acceptor” apparatus. Luria concluded that the frontal lobes also had the function of “allowing for the effect of the action carried out and verification that it has taken the proper course” (Luria, 1973, p. 93). Luria asserted that complex psychological processes have systemic structure and that each form of conscious activity represents a complex functional system and takes place through the concerted working of all three brain units (Luria, 1973). Citing Leontiev (1959), Luria described the modern understanding of the structure of mental processes as having moved on from isolated faculties, being based instead on the model of “a reflex ring or self-regulating system” with afferent and effector components, so that “mental activity assumes a complex and active character” (Luria, 1973, p. 99). In conclusion, one should say that the fascinating work of Alexander Luria is greatly underappreciated in neuroscience. While his compatriots Lev Vygotsky and Ivan Pavlov received much recognition and many accolades for their contributions in the fields of psychology and the biology of behavior, Luria remained relatively unknown. Luria’s insights into the functions of the human brain, the development of psychopathology, and managing neural injuries are extraordinary at many levels. His description of the bottom-up development of the brain and indicators for treatment provided critical direction for future research and are in line with later neural research by Paul D. MacLean (1990), who developed the theory of the triune brain. This is remarkable since (as far as we could establish) there is no reference to Luria’s research in the works of MacLean. The resemblances between MacLean’s well known theory and Luria’s lesser known theory are nothing short of remarkable. Luria’s focus on the role of the sensory impulses (primitive neural structures) resembles MacLean’s reptilian complex. The resemblances with the development of the paleomammalian and neomammalian complexes are also clearly identifiable. It is noteworthy that Luria’s descriptions of the interplay between the advanced cortical system and the primitive system are more clearly and specifically articulated than in MacLean’s model, and that this interplay was identified prior to MacLean’s theories being published. One can only marvel at the insights of Luria and speculate on the possible advances in neuroscience had the effects of ideological isolation not been the global phenomenon that they were. Akhutina, T. V. (2003). L. S. Vygotsky and A. R. Luria: Foundations of neuropsychology. Journal of Russian and East European Psychology, 41, 159–190. Anokhin, P. K. (1935). Проблема центра и периферии в физиологии нервной деятельности [The problem of centre and periphery in the physiology of nervous activity]. Gorky, USSR: Gosizdat. Ardila, A. (1991). Spanish applications of Luria’s assessment methods, Neuropsychology Review, 9(2), 63–69. Glozman, J. M. (2007). A. R. Luria and the history of Russia neuropsychology. Journal of the History of Neurosciences: Basic and Clinical Perspectives, 16, 168–180. Cowart, C. A., & McCallum, R. S. (1990). Testing Luria’s model: A reply to Naglieri and Das. Journal of Psychoeducational Assessment, 8(2), 172–176. Goldberg, E. (1990). Contemporary neuropsychology and the legacy of Luria. Hillsdale, NJ: Lawrence Erlbaum. Golden, C. J., & Berg, R. A. (1981). Interpretation of the Luria-Nebraska Neuropsychological Battery by item intercorrelation: VII. Receptive language. International Journal of Clinical Neuropsychology, 3(3), 21–27. Holowinsky, I. Z. (1993). Pedology in Europe and developmental psychology in Ukraine. School Psychology International, 14, 327-338. Homskaya, E. D. (2001). Alexander Romanovich Luria: A scientific biography. New York, NY: Kluwer Academic. Kuzovleva, E., & Das, J. P. (1999). Some facts from the biography of A. R. Luria. Neuropsychology Review, 9(1), 53–56. Lewis, R. D., Hutchens, T. A., & Garland, B. L. (1993). Cross-validation of the discriminative effectiveness of the Luria-Nebraska Neuropsychological Battery for learning disabled adolescents. Archives of Clinical Neuropsychology, 8, 437–447. Luria, A. R. (1963). Restoration of functions after brain injury. New York, NY: Macmillan. Luria, A. R. (1966). Higher cortical functions in man. New York, NY: Basic Books. Luria, A. R. (1966). Human brain and psychological processes. New York, NY: Harper & Row. Luria, A. R. (1970). Traumatic aphasia: Its syndromes, psychology, and treatment. Berlin, Germany: Mouton de Gruyter. Luria, A. R. (1973). The working brain: An introduction to neuropsychology. New York, NY: Basic Books. Luria, A. R. (1976a). Basic problems of neurolinguistics. The Hague: Mouton de Gruyter. Luria, A. R. (1976b). Cognitive development: Its cultural and social foundations. UK: Cambridge University Press. Luria, A. R. (1976c). The nature of human conflicts. New York, NY: Liveright. Luria, A. R. (1976d). The neuropsychology of memory. Washington, DC: Winston. Luria, A. R. (1979). The making of mind: A personal account of Soviet psychology. M. Cole & S. Cole (Eds.). Cambridge, MA: Harvard University Press. Luria, A. R. (1982). Paradoxes of memory. Soviet Neurology and Psychiatry, 14, 3–13. MacLean, P. D. (1990). The triune brain in evolution: Role in paleocerebral functions. New York, NY: Plenum. Solso, R. L., & Hoffman, C. A. (1991). Influence of Soviet scholars. American Psychologist, 46, 251–253. Tulviste, P. (1991). The cultural-historical development of verbal thinking (M. J. Hall, Trans.). Commack, NY: Nova Science. Tupper, D. E. (1999). Introduction: Alexander Luria’s continuing influence on worldwide neuropsychology. Neuropsychology Review, 9, 1–7. Лурия А. Р. Восстановление функиций после военной травмы. М.: АМН СССР, 1948. Лурия А. Р. Высшие корковые функции человека и их нарушения при локальных поражениях мозга. М.: Изд-во МГУ, 1969. Лурия А. Р. Маленькая книжка о большой памяти (Ум мнемониста). М.: Эйдос, 1994. Лурия А. Р. Мозг человека и психические процессы. Т. 1-2, М., 1963. Лурия А. Р. Об историческом развитии познавательных процессов: экспериментально-психологическое исследование. М.: Наука, 1974. Лурия А. Р. Основные проблемы нейролингвистики. М.: Изд-во МГУ, 1975. Лурия А. Р. Основы нейропсихологии. М.: Изд-во МГУ, 1973. Лурия А. Р. Потерянный и возвращенный мир (История одного раниния). М.: Изд-во МГУб 1971. Лурия А. Р. Природа человеческих конфликтов. М.: Когито-Центр, 2002. Лурия А. Р. Травматическая афазия. Клиника, семиотика и восстановительная терапия. М.: АМН СССР, 1947. Лурия А. Р. Этапы пройденного пути [Научная автобиография психолога.] М.: Прогресс, 1985. I have translated one of Luria’s works from the original Russian and have it available on my website for a free download in ePub, Rich Text or PDF.